A dramatic change in the weather conditions for the third day’s racing in Gas Calves Week 2015 brought the fleet out to the Fastnet Rock in brilliant sunshine and light winds. The latter meant for a long day, particularly for the smaller whitesail and cruiser fleets, and some anxiety at the Rock for those boats whose arrival coincided with the change in the tidal flows around it. Race Officer Alan Crosbie sent the fleets, starting in reverse order (Whitesail first), directly out to the Rock for the initial starters, and up Long Island Sound and around Goat Island for the faster Class 0/1 and 2. Returning boats had a choice of route, and those who chose a run up Long Island Sound gained a clear advantage over those who chose to stay outside the islands. Getting the better of the conditions, Paul O’Higgins on Rockabill V (RIYC) took Class 0/1 IRC ahead of Conor Doyle’s X442 Freya (KYC) with all to play for on the final days sailing for overall honours. Ronan Harris on Jigmaree (RIYC) took third place in both IRC and Echo, behind the same boats in reverse order. The contest for overall honours in Class 2 IRC is also very close, with Frank Desmond’s Sunfast 32 Bad Company (RCYC) taking first place ahead of overall leader Leslie Parnell’s First 34.7 Black Velvet (RIYC). Dexterity (Foynes YC) came third. In Echo however, local boat Quinsea helmed by Barry Quinlan (SHSC) were able to beat off stiff competition from Val Kriss (KYC) and Bad Company. A boat from Cork Harbour will win Class 3 IRC but as yet it is not clear whether it will be one from Crosshaven or Cove. Jimmy Nyhan on Outrigger (RCYC) came in ahead of Muskateer (Doyle/Russell) from Cove with YaGottaWanta (RCYC) taking third. Judy McGrath on Impala 28 Bonanza is still overall leader after strong results in the first 2 days. In Echo, the race is more open with Diarmuid Dineen from Tralee Bay Sailing Club on Growler leading ahead of local boat Manzanita helmed by John Molloy (SHSC). However longstanding contender Padraig O’Donovan on Chameleon (KYC) had the best result on the day in the light winds. In Class 4 IRC, Shelly D would seem to have the overall prize sewn up after a third first. Echo honours were won by Oonagh Buckley on Tete a Tete (SHSC). IRC Whitesail Class 1 overall will come down to the final day’s results between Sean O’Riordan’s First 36.7 Y-Dream (KYC) and Niall Palmer Sheehan’s Sun Legende 41 (SHSC). Honours on the day however were swopped between Cove Sailing Club’ Cortegado (Kneeshaw/Murphy) who took IRC and visiting UK XC45 Samatom who lead ECHO honours. 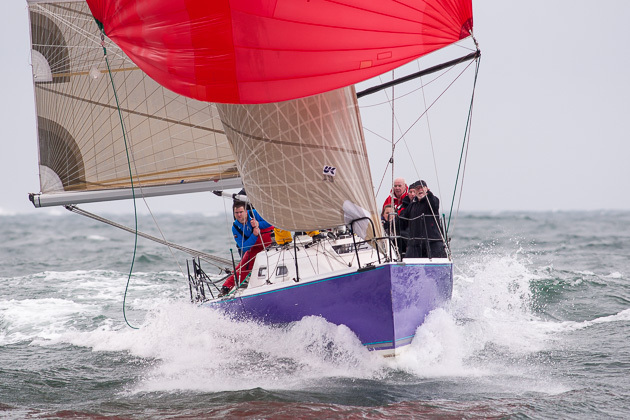 Local First 27.7, La Perle Noire, helmed by Deborah Crowley, won against a strong challenge from local competitor Storm 33 Jasmine, helmed by Don Boadella. Today’s race counted for a SCORA offshore race. GAS Calves Week, Day Two. Race officer Alan Crosbie started all fleets inside Schull Harbour beginning with a beat south to the Calf Islands then to Goat Island, down Long Island sound and repeat. I n Class 1 IRC Conor Doyle’s Freya(KYC) leads overall after a win today. True Pennance(RCYC) placed second. Under ECHO the overall leader is also Freya, today’s race was won by True Pennance. In Class 2 Black Velvet (DLMBYC/SHSC) took the honours in IRC and now leads overall with Jedi (Cove Sailing Club) second and they jointly lead the class overall. Under ECHO Denis O’Sullivan won in Aris with Rioja from the Royal Cork second. In Class 3 IRC Judy McGrath in Bonanza (RCYC) won again and Dave Lane and Sinead Enright placed second in YaGottaWanna (RCYC)and both yachts hold the same positions overall at the halfway stage. Under ECHO Diarmuid Dineen in Growler(SHSC) won and leads overall with John Molloy in Manzanita(SHSC) placed second today. In Class 4 IRC Michael Murphy RCYC/SHSC) leads Tom Kirby and Sean Norris in Raffles (RCYC/SHSC) overall with two races sailed. Under ECHO Bombora from Cove Sailing Club pipped them both to take today’s race and the overall lead. In Whitesail 2 ECHO Tadgh Dwyer in Brazen Huzie (SHSC) won race 2 and Colin Morehead in Giggles (SHSC) was second. However, Martin Lane in Chatterbox,(SHSC) with a second and third leads the class overall at the halfway stage. Tomorrow, Thursday, is scheduled as Fastnet Race Day, a highlight of the week. However the running of the race is now in doubt due to a forecast of light winds and a decision will be taken in the morning. A possible option is to sail the bigger boats to the Fastnet and give the smaller boats a shorter course.